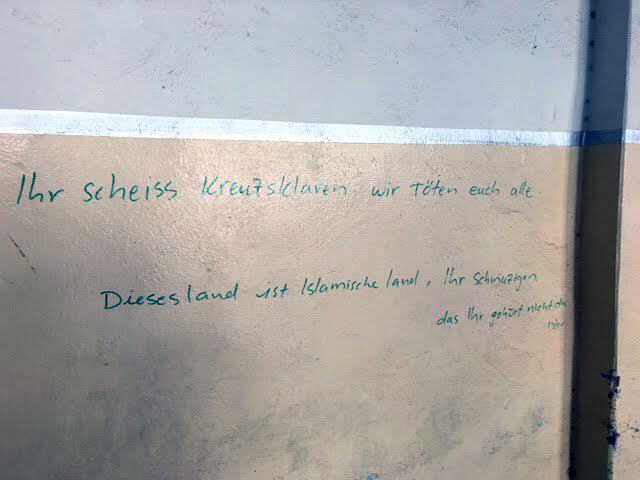 In an eerie reminder of ISIS recruiting foreign fighters, provocative graffiti in German was found on the wall of a chapel during an inspection of the small town of Batnaya, on the Nineveh Plane. The small town, just 10 miles from Mosul, was recently recaptured from ISIS. It had been home for 850 Christian families. Stephen Rasche, an advisor to the Chaldean Archdiocese of Erbil who took photos of the graffiti and also documented the great degree of destruction in Batnaya, told international Catholic charity Aid to the Church in Need: “The most important thing is to show the great degree of destruction so people can understand what has happened and just how dangerous it still is to return. Destruction was also evident in the neighboring town of Karamles, which lies about 18 miles southeast of Mosul. Apart from desecrated and destroyed churches, along with broken and mutilated statues saints, Rasche made a particularly shocking find when he came upon the desecrated grave of a priest. He reported: “the grave of one of our priests was dug up and the corpse removed. We found his vestments and the lid of the coffin, but there was no trace of the corpse.” ACN learned that the deceased was Father Salem Ganni, a priest who passed away in 2009, a relative of the 34-year-old priest Father Ragheed Ganni, who was shot dead in Mosul in 2007.